The most effective at removing chlorine, sediment, and volatile organic compounds (VOCs) from water. They are not effective at removing minerals, salts, and dissolved inorganic compounds. Typical particle sizes that can be removed by carbon filters range from 0.5 to 50 micrometers. 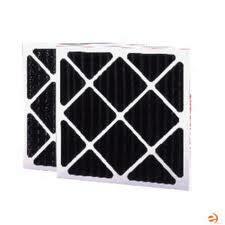 The particle size will be used as part of the filter description. The efficiency of a carbon filter is also based upon the flow rate regulation. When the water is allowed to flow through the filter at a slower rate, the contaminants are exposed to the filter media for a longer amount of time. 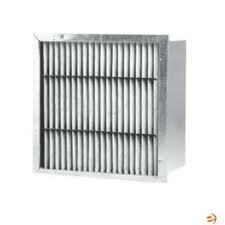 Carbon filters are available in panels, pads, pleats, ring panels, rigid cells, filter rolls, and trays for housing units. The Flanders FCP Series adsorbers are designed for removal of malodorous compounds at low concentration levels. Utilizing the latest technology in fine mesh activated carbon, the product provides high removal efficiency of nuisance odors. Pre Pleat with activated carbon works almost like an odor “sponge.” This versatile filter is an excellent choice in commercial/industrial settings for remediation of minor odor problems. 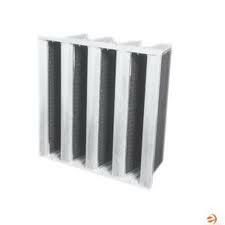 This filter combines the low resistance, high dust holding capacity of a pleated filter with the odor removing abilities of activated carbon. The base filtration medium is polyester synthetic fiber. It has a generous 100% add-on of activated carbon by weight. As odor producing gases come in contact with the activated carbon in the filter, they are adsorbed, trapped and held in millions of microscopic carbon pores. The Flanders VaporClean vapor phase absorbers are designed for removal of molecular contaminants at low concentration levels while utilizing the proven technology of dry processed carbon composite media, (DPCC). The absorbers provide high efficiency removal of multiple contaminants for applications within museums, archive storage facilities, airports and semiconductor fabrication facilities. Flanders Super-Flow¨ VC Disposable Activated Carbon Absorbers are designed for gaseous contamination control in both new and existing HVAC systems. 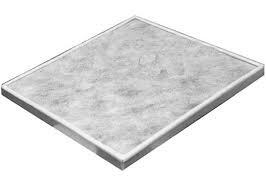 Super-Flow¨ VC Absorbers have total-detention capability with all air passing through the carbon beds. These absorbers can help mitigate Indoor Air Quality problems in buildings where the air must be cleansed of gaseous contaminants. They are also useful in a variety of other applications such as the protection of light industrial processes and works of art.